LIKE I think she's verging on psychosis . . . now she's lashing out. Sixteen year-old Audrey just wants to be normal. She's trying to fit in. But what happens when the person closest to you suffocates you with their love? What happens then? Louisa Reid is a writer and teacher living on the Fen Edge. Her debut novel, BLACK HEART BLUE was published in 2012 by Penguin and was shortlisted for the North East Teen Book Award and longlisted for the Carnegie and Branford Boase awards. 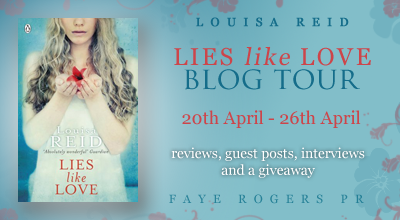 Her second novel, LIES LIKE LOVE was published in July 2014 by Penguin. There is a tour wide giveaway during the tour. Lies Like Love is a story. A heart breaking, gut wrenching, slow paced, exciting story, filled with all the feels a mortal heart can take. Audrey has always had problems. Bullying, a fire. Audrey's mother has spent her life, energy and money taking care of her- herding Audrey and her baby brother Peter all over. But now, she wants things to change. Or wants to try. In this new town, where nobody knows anything about who she used to be, and the things that happened. On this new town where she can be whomever she chooses. Except, that's easier said than done. Teenagers are hard to get to know, but even more so when you're terrified of them. But Audrey meets a boy. A boy who can see past her glasses, and her awkward exterior. A boy who wants to get to know her. The real her. 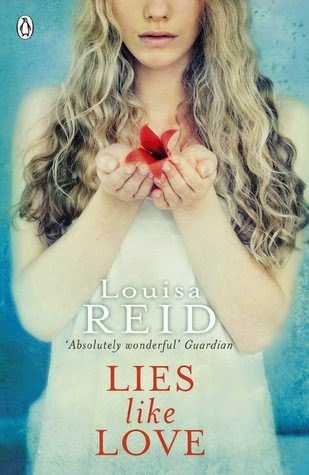 Louisa Reid is a BEAUTIFUL writer. Her characters are so complicated and brilliant, With so may layers and so many sides to them. There is this hint of instability in Audrey's writing, that makes the reader question whether to believe her, or what her mother says; this hint of paranoia, or that she's making it all up or that's she's exaggerating- that keeps you guessing, and in a book like this- it was the best part! A bit slow paced, but a book worth reading all the same! That novel sort of reminds me of Mara Dyer. I wasn't a big fan of that series but loved the concept - maybe this is a second chance.